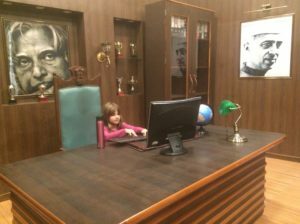 There are many things to do with kids in Mumbai, however; if you only have about 48 hours, here are three of my recommendations. This is not an exhaustive list, but rather the things that we did with our girls in Mumbai. 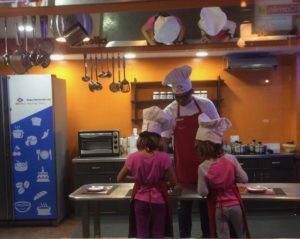 It represents a combination of paid and free activities, as well as a mix of things that parents and kids can enjoy alike. 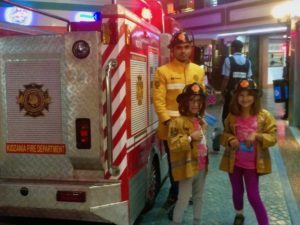 Kidzania is an indoor theme park and replica of a city where kids either get paid in KidZos currency to do jobs such as firefighter, doctor, baker, airline pilot, model, etc., or pay to shop, be entertained, or do activities such as making pottery or jewelry. The adults simply sit back and watch their kids try different things. Kidzania is aimed at kids 4-12, so if you have younger toddlers, or teens, this is not a good fit. My girls were 6 and 8 when we went and they had a blast. It can get busy with class trips and most activities can only take about 8 kids at a time. Activities are generally around 20 minutes long, so you’ll need to plan accordingly. In terms of cost, it’s Rs.1200 (US$18) for kids 4-16 and Rs.550 for adults 17-59 (US$8). Extra costs include food and souvenirs. Like other theme parks, there are staff taking pictures of your kids which you can purchase either as a photo, or have turned into a magnet or other souvenirs. We bought the magnets, but as expected, they are not the best quality. 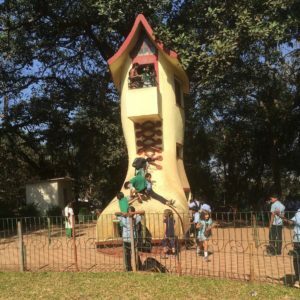 Kamala Nehru Park is a lush, open park, visited by many school children. The main attraction is a structure in the shape of a large boot, from the nursery rhyme ‘There was an old lady who lived in a shoe’. 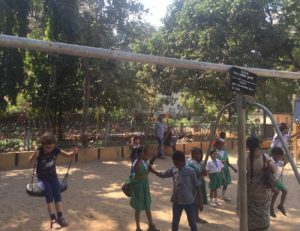 Just before the park is a playground, also filled with Indian school children. The park overlooks Chowpatty Beach, Marine Drive, and offers a great view of the Mumbai skyline. We liked it because it gave our girls a chance to be outside, run around, and play with other kids. Also it’s free (except the cost of the taxi), which is an important consideration when you’re traveling long-term. We booked a Bollywood Studio tour through our hotel. We were shown where some of the stars live, as well as taken on a tour of S.J. Studios. 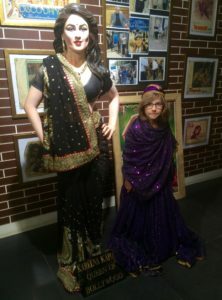 At the Studio we visited different sets, tried on outfits used in movies, saw a Bollywood dance performance, watched a short movie about the history of Bollywood, and saw a TV show being made. I haven’t been on a Hollywood tour and so for me, this was pretty interesting. The studio itself was a bit underwhelming, but then again, the actual making of movies isn’t as glitzy as the final product. It’s in a more industrial part of the city, so be prepared for a long drive to/from the studio. While my girls (6 & 8) enjoyed it, I would recommend this for older kids (10 & up) who may have more of an interest in how movies are made. If you’ve been to Mumbai with kids and have other activities you recommend, please put them in the comment box below.